On display are artifacts from Enrico Fermi and other scientists at the Met Lab, which researched nuclear reactions during World War II. The Regenstein Library Special Collections is currently displaying an exhibit on the University’s role in the development of the atomic bomb and how University scientists reacted to the bomb in the decades after its invention. The exhibit, titled Science and Conscience: Chicago’s Met Lab and the Manhattan Project, began today and will continue until April 13. The exhibit comprises manuscripts and artifacts from the scientists who worked in the Metallurgical Laboratory (Met Lab), the code name for the University lab that investigated nuclear reactions during World War II, including a letter written by then-President Harry Truman defending his decision. In addition to declassified government files and personal letters, the exhibit includes other notable artifacts, such as Enrico Fermi’s 1938 Nobel Prize in Physics. Fermi was in charge of creating the first Nuclear Reactor, Chicago Pile-1 (CP-1). The experiment was conducted under the west stands of the old Stagg Field, a site now marked by Henry Moore’s sculpture Nuclear Energy. “The original intention was to build [the reactor] out at the Argonne Forest Preserve,” Meyer said. “They were going to have a building constructed and put the Pile inside it, but there was a labor strike.” With the fear of losing momentum, the project decided to conduct the experiment under Stagg Field. “They trusted Fermi’s calculations that the experiment could be carried out successfully and that the reaction could be controlled,” Meyer said. In early 1943, the reactor was disassembled and taken out to the Argonne Forest Preserve, where it was put back together as Chicago Pile-2. The University continued to play a prominent role in the Manhattan Project, however. The Met Lab used dozens of campus buildings, including Eckhart, Ryerson, and Kent, and several new buildings were constructed for it. The exhibit contains booklets and pamphlets detailing proper security protocol for members of the Met Lab. At any given time during World War II, the Met Lab employed about 2,000 people on campus. This number decreased to 1,300 after the war, Meyer said. To minimize security risks, the University housed hundreds of Lab employees on campus in a large building where Eckhardt Research Center now stands. After Germany surrendered in May 1945, a group of scientists led by James Franck petitioned the government against the use of the atomic bomb on humans. “Franck tried to get the government to think through different options before dropping the bomb,” Meyer said. He proposed that the United States set off a demonstration bomb to show the world the bomb’s destructive capabilities. In 1946, the Met Lab was turned into Argonne National Laboratory. Some personnel from the Lab were transferred to the newly created Fermi and Franck institutes, which focus on the study of nuclear and molecular science. 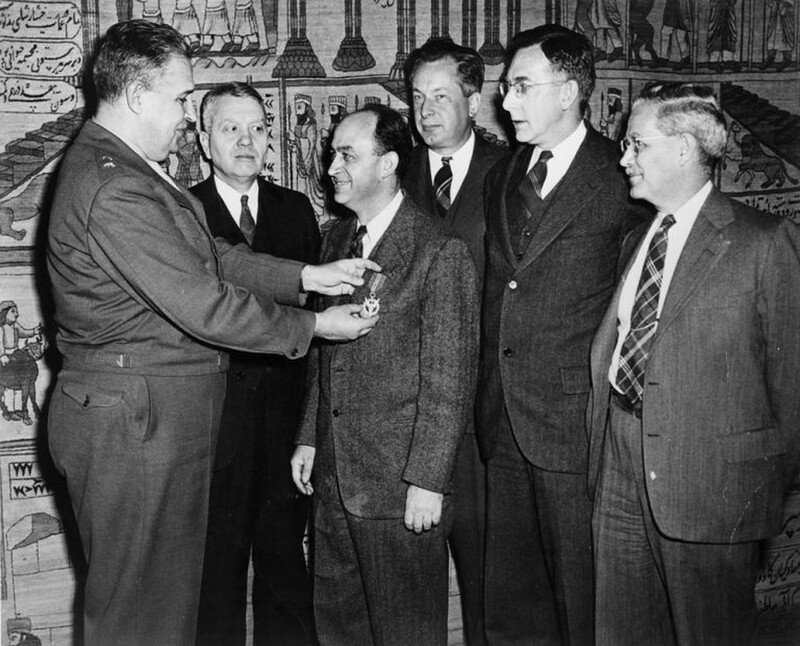 These efforts, led by University of Chicago scientists, resulted in the passage of the Atomic Energy Bill, which shifted control of nuclear power away from the military and into civilian authority. University scientists also created the Bulletin of the Atomic Scientists, a periodical that promotes the peaceful use of nuclear power. The exhibit is on display on the first floor of the Regenstein Library.